Create a digital photo calendar scrapbook using your photographs and make your own recycled display case. Plan ahead! Impress your friends with your pre-cognitive powers! All you need is a photo from that fancy digital camera of yours. Heck, go nuts and make a 2010 photo calendar on New Year family reunion photos. The Year, Month and Date on templates can be rewriten as your pleasure, so you just need select the template you loved and Make fabulous Photo Calendar- Yearly Calendar or Monthly Calendar. Once again, we come to the Holiday Season! From home to home, and heart to heart, from one place to another, the warmth and joy of Christmas brings us closer to each other. Making Holiday greeting cards is really a work that takes time. Lots of love you need to put into the cards. It recalls the half-forgotten faces of friends I used to cherish, and loves I used to know. Email flash and Christmas greeting flash e-cards which include the pictures of your friends, your family and your children, are the most personalized Xmas greeting e-cards you can send. 1. Cards email free and unlimited, save you postage and expensive paper cards. 2. An email flash e-card can along with animation and music when you send your Christmas flash greetings . 3.There are plentiful well designed flash templates. 4.You can create an email flash greeting Xmas e-card in 5 minutes. 5.Send it to anywhere at any time. Current template which is displayed in the preview window will be used as template for the email flash greeting e-card.Once the template is applied, you can go to Decorate tab window to add some decorations or directly publish the Christmas email flash e-card. Transition effect is the effects displayed between two adjacent photos. It makes the transition between photos smooth and good-looking. Click one transition effect and preview its result in the preview window on the right hand side. Text is the most basic elements you can add to your email flash. An occasion as warm as Christmas has rightly inspired wonderful thoughts and nice quotes on it. A quotation is filled with wisdom, emotion, tenderness and thought. If you have no idea what to say, it's a good choice. Before starting to send flash via email using Outlook or Outlook Express, a flash file in SWF format must be created as usual. Therefore, you should specify file name and location for the SWF file. You should enter email address of desired people first and then click "Send" to start off. If you want to send your flash to many people in one time, simply enter all email addresses which are separated by semicolon ";". Or save the flash as swf then send it to your friends as attachment. Ok, that's done. An impressive email flash ecard is created in minutes. How to make and print clip art card ? Creating your own funny clip-art card isn't difficult and placing it on e-cards is also a straightforward process. If you really want to personalize your cards clipart and make someone smile or laugh at the same time, you're definitely on the right track with this ideas of card. The following steps outline how you can get started creating fun clipart for Thanksgiving day 2009 to send out to friends, family and co-workers. Here we take the Photo Collage Software for an example. Brainstorm your clipart design ideas of card by sketching or doodling them in a sketchbook using colored pencils. Silly or goofy designs can often be the most amusing. Ironical ideas card or witty clip-art carddesigns can also be quite funny and memorable. Remember that the goal is to create clip-art card to make someone smile when she opens the clip art card, so the art shouldn't be too involved. It's best to avoid anything distasteful. The first step in creating your clip-art card is selecting the individual pieces you want to use. This includes photos, clip art, stamps and text tabs. Each tab allows you to add a different type of cards clipart component. Simply choose the category you wish to view from the pull-down, then drag-n-drop the clipart cards or stamp you want in the same way that you added your images. Rotate, resize, crop and reposition each piece as you see fit. To add text, just switch to “Text” tab, and click ‘New Text” and then type your text in the text box. You can also set your font, size, style, alignment and color. Check the Shadow box to add a shadow to your text. In Print Clip Art Card tab window, you can print your cards clip art directly using the print tool in Photo Collage Studio. Before that, you could specify settings about how to print your clipart. If you have create many pages of clip art card in one project and you want to print only some of clipart cards, you should select desired pages to print. To do so, click the button to bring up a window to select pages from. By default, all pages would be checked to print. To print specified pages, you have to uncheck the pages you don't want. Make sure that only the pages you want to print have the tick sign at the bottom left corner of each page thumbnail. Select page orientation of your clip art card on the top left hand side. By default, the orientation would be Portrait. Portrait works for most documents, which means its height is taller than its width. On the other hand, you can select to print your clipart page in Landscape orientation, which means its width is longer than its height. To make advanced settings for printing clipart, you can click button to open the setting dialog, in which options of Printer, Page range, Copies and so forth are available. You can even make in-depth parameters of selected printer by clicking "Properties" button beside the printer name drop-down list. See the printer manual for detailed information if possible. The layout option allows you to select or customize the layout of your selected clip art card pages. 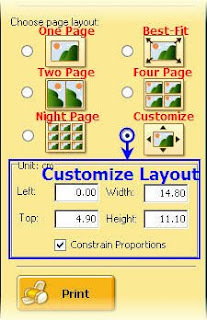 For a fixed background, you can contain one, two, four or night pages in the same printed cards clip art page. Furthermore, you can make your selected clipart cards pages best fit the background or customize the layout yourself. As soon as all the settings have been done, you could print all your selected clip-art card pages now! This simple flash making tutorial will show you how to make a simple, yet effective, slideshow-type 3D image gallery.It's easy and interesting and the process needs no flash or XML skills at all. Simple flash making is a good way to keep these precious thanksgiving activity memories as a flash keepsake, which can be used to enhance your photo presentation with stunning and colorful 3D effects.and share with friends and families on website, blog or MySpace. Thanksgiving is a holiday overflowing with joy .It's a wonderful time to take photos of family members and friends.As families gather, the cameras come out to capture magical moments of Thanksgiving activities to enjoy and share through the years! You may find that the software includes Gallery and Slideshow two modes. To make 3d flash gallery, please choose Gallery Mode. This article will offer some ideas to relive your old family photos and preserve family memories by making digital family album DVD for TV and sharing with others. More and more people take digital photos using camera. For a general family, they capture photos to remember happy events and precious moments, from special celebrations and holidays to everyday moments. And with time going on, they have got either multiple big family photo album or loads of digital photos in some corners of computer. If you are a photography enthusiast since long time ago, you may have several family photo album regarding to summer vacation, family reunion, wedding, Christmas and general holidays. This is the good way to save family memories. To get more fun and showcase your creativity, I suggest you to digitize these photo, therefore, you can make family digital scrapbooking, family photo album, online family tree building, and more. Don't know how to digitize old photo on your family photo album? Check out how to scan old photos to DVD. You may also be interested in taking good family photos. No Skills Required: Drag and Drop to make Family photo album DVD, using your creativity to make unique family album DVD. It's you who can make family photo album DVD and give a surprise to your relatives. Amazing transitions for family photo album: Tons of transitions and motion effects to help you make family photo album smooth. Animated titles: Want to say something on family photo album? Just add titles and make it animated after specifying text effects. Well-designed DVD Menu: A good DVD menu plays important part of family photo album DVD. Now you don't need to design a good-looking DVD menu from scratch. Family photo album DVD maker provides many well-designed DVD menu templates. Organize your Family photo in albums. After burning DVD, watch them one by one with the help of easy navigation DVD menu. One-Click to Burn Family Album DVD: It has never been easier to burn your Family photo album to DVD with elaborate DVD menu. Just select DVD as output method and start burn photo album to DVD. No other DVD authoring and burning software needed. Support VCD and Video: You could also select VCD as output method to make Family photo album VCD as you like. Making Family photo album video in MP4, AVI, WMV, 3GP, MPEG-I, MPEG-II is also available. Therefore, you can even watch your Family photo album on your mobile phone. So, just imagine a beautiful DVD menu with multiple frames and a background photo of your family. Click each frame go to enjoy that photo album, say family reunion, and more for summer vacation, family picnic, family barbeque, etc. Hard to make. Not at all with DVD Slideshow Builder. It allows you make family photo album DVD with good-looking DVD menu in a snap! After importing family photos and music, authoring beautiful album DVD menu, you could then burn family photo album DVD with CD and DVD burner. If needed, you could also choose stunning 2D and 3D transition effects. Plus, sweet titles/credits are necessary for family photos. It's easy to add animated titles/credits with text effects. In a word, Wondershare DVD Slideshow Builder is powerful but easy-to-use family photo album creator. All popular photo and video formats are supported. Not only photos could be added in this photo dvd maker, it's also available now to combine photos and video into entire movie story! Besides, external audio source, e.g. music file, recorded sound can make your photo album more attractive. Following video and audio formats are supported by this excellent photo dvd maker program. Make a customized DVD menu with titles, background images, background music and more. You save finished menu to Custom category and use again next time to create family photo album DVD. All disc types could be used if your dvd burner could recognize them. DVD+R: DVD+R is a once-writable optical disc with 4.7 GB of storage capacity. DVD-R: DVD-R is a DVD recordable format with storage capacity of 4.71 GB. DVD+RW: DVD+RW is the re-writable optical discs with about 4.7 GB storage capacity. DVD-RW: DVD-RW disc is a rewritable optical disc with equal storage capacity to a DVD-R, typically 4.7 GB erase and rewrite to a DVD-RW disc. - Microsoft Windows 2000, XP(SP2) and Vista. - Intel Pentium IV 1GHz and above or AMD Athlon equivalent. - 256 MB RAM (512MB Recommended). - TV connected to DVD/VCD player. Family Songs Lists ( Family song name - Singer). More Family Songs. Download Family Album DVD Maker Free Trial To Have a Try! Or watch another family slideshow sample! More and more people take digital photos using catch-and-shot camera. For a general family, they capture photos to remember happy events and precious moments, from special celebrations and holidays to everyday moments. And with time going on, they have got either multiple big family photo album or loads of digital photos in some corners of computer. This article will offer some ideas to relive your old family photos and preserve family memories by making digital family album DVD for TV and sharing with others. There are many torrent clients online today. BVuze, also known as Azureus, can be used to downloaded movies, videos, and music or be used as a bittorrent client like Utorrent to download torrent files. Therefore, there could be many different formats of the downloaded Vuze movies like AVI(or DVDRip), MKV, RMVB, MP4, etc. If you would like to convert downloaded movies from Vuze to DVD, it's important to get a Video to DVD Burner which supports those popular video formats. Below we show you simple steps of burning downloaded Vuze movies to DVD using Wondershare Video to DVD Burner. Step 1: Free download Wondershare Video to DVD Burner and install it. Meanwhile, you can insert DVD-R (DVD+R, DVD+RW or DVD-RW) into DVD optical drive-DVD burner. Note: The DVD-ROM should have writing and recording functions. Click "Load Video" to browse your computer and find the downloaded Vuze movies which you want to convert, then add the Vuze movies from your hard drive to the program. Then they will appear in the collections pane. Drag and drop loaded Vuze movies to slideshow storyboard, even you have just one video file to burn. If you just want to burn one video or movie to DVD, select it in the storyboard, then click "Burn" tab. But if you want to convert multiple video clips or movie files together to one DVD disc, making a video slideshow would be a good choice for you! After you have dragged and dropped Vuze movies to the slideshow storyboard, you can begin to organize a slideshow. Order: You can sort the order of the videos in the storyboard by dragging and dropping. Add a slide: right click mouse and select the first option "Add Slideshow" to add a slide. Then you can add other Vuze movies to this slide. There are two other options: "Remove Slideshow" and "Play Slideshow", just do as you like. Edit a video: select a video in the storyboard, right click mouse, and you will see three options: "Edit", "Remove", and "Clear All". Just select "Edit" to edit video effects. You can easily trim video length to split a movie into two parts, crop the size to enjoy a full screen, etc. Transition: Click "Transition" and you will see all the available transition effects in the transition pane. A simple click could help you to display the transition effect in the right window. Just drag and drop the transition effect you want to the middle of two videos in the slideshow storyboard. Tip: If you want the movie to play continuously without transition, you can select the transition in the storyboard, right click mouse, and click "Remove" to remove the transition effect. Click "Menu" to customize your DVD menu. There are different styles of built-in templates, frames and buttons for your choice. To apply a template, frame or button, you can just double click it. You can even add text, background music and background image to customize the menu. click "Preview" to preview your slideshow. This step is to help you decide if everything is what you have expected. If not, you can go back to any of the previous steps to make changes to your project. For DVD disc: Click "Burn", select "DVD" option in the "Burn to" field, specify a temp folder (used to save the generated temporary files), select your DVD drive and burning program (either built-in or your own burning application), select your TV Standard and output Aspect Ratio, and click "Start" to burn your project. For DVD folder or an ISO file: Click "Burn", select the "DVD Folder" or "ISO file" option, specify a folder to save them, and click "Start" to generate DVD files or ISO onto your computer. TV Standard: "NTSC" is 30 fps, which is used in USA, Canada and Japan; "PAL" is 25fps used in Europe and Asia. Tips: The used disc space is shown on the disc space bar underneath the storyboard; You can select the size of burning DVD between "DVD-R4.5G" and "DVD-R9.0G"; The output quality is also up to your choice, you may select "Low video quality", "High video quality" or "Highest video quality". Bitsdujour.com announced that Wondershare Software will soon be featuring Photo Collage Studio ComboPack 50% discount ($14.95 saved) for 24 hours on Saturday September 5, 2009. Wondershare Photo Collage Studio ComboPack is a fun and easy tool to make impressive photo collages and digital scrapbooks with your photos. In Photo Collage Studio, you can drag-n-drop to create unforgettable gifts and keepsakes. Like a digital scrapbook complete with customized drawings. Or greeting cards and gorgeous calendars that keep the smile going all year long. Just choose a colorfully designed template, drop in your photos, customize your text, add cliparts, photo frames, and click. Beautifully printed pieces will be delivered to you in minutes and shared anywhere! Over 300+ professional designed collage templates for any occasion, such as Christmas, New Year, Wedding, Birthday, Love, give you more inspiration. What’s more, you can create photo books, greeting cards, calendar, desktop wallpaper and print them out at any size or save them as various digital image formats to share over email and the web! It will only be available on Bitsdujour.com for 24 hours. To make sure you won’t miss the deal, you can visit the review page right now, and click the "Nofity Me" button or subscribe your information on notification page to receive an email when this deal goes live. If you have any friends or family members who might be interested in Photo Collage Studio ComboPack please let them know about this sale, to get Photo Collage Studio ComboPack at $14.95 on Saturday September 5, 2009. Many of my friends often ask me how to burn WMV to DVD to enjoy on TV or DVD Player. So i write this simple and easy-to-master guide to lead you how to convert WMV video to DVD and burn WMV video to DVD Disc to play on TV or DVD Players. The tool you will need is Wondershare WMV to DVD Burner, which can make DVD from WMV video slideshow with customizable DVD menu and transition effects by editing the video freely. Edit WMV video effects such as crop video size, capture video clip, and adjust brightness.. Combine infinite quantity of WMV video files to a slideshow of 20 slides at most by simple dragging and dropping. Create personalized DVD menu from 32 menu templates and 60+ transition effects. Add your favorite music from your computer hard disk to the slideshow as the background music. Preview any part of the video slideshow by selecting slideshow title and dragging the process bar. 1. Click "Load Video", then a window will pop up for you to browse your computer. Simply find the WMV video files which you want to convert, select them, click "Open" to add them to the program. Then they will appear in the collections pane. 2. To play a WMV video, select it (by single-clicking) and click the round tab beneath the right window. 4. With WMV to DVD Burner, you can burn WMV video to DVD disc, DVD folder, or ISO files as you like. If you want to burn WMV video to DVD disc, just select "DVD", then the program will auto detect the DVD burner on your computer and ask you to insert a blank DVD disc. 5. If you decide to convert WMV to DVD folder or ISO, select the option, and click "Open" to specify a directory to save generated DVD folder or ISO files. 6. Click "Start" to start converting/burning WMV to DVD. If you have multiple WMV video files and want to combine them together and burn to DVD, organizing a WMV video slideshow would be a good idea. Try it now! 1. Add and play WMV video files: please read the first and second steps above. 2. Organize a WMV video slideshow: drag & drop WMV video files from the collections pane to the storyboard below to start organizing your slideshow. A slideshow of 20 slides at most is up to your choice. Order: you can sort the order of the WMV video files in the storyboard by dragging and dropping. "Remove Slideshow" and "Play Slideshow", just do as you like. "Remove", and "Clear All". Just select "Edit" to edit video effects. 3. Transition: click "Transition" and you will see all the available transition effects in the transition pane. A simple click could help you to display the tiansition effect in the right window. Just drag and drop the transition effect you want to the middle of two WMV video files in the slideshow storyboard. 4. Menu: Click "Menu" to customize your DVD menu. There are different styles of built-in templates, frames and buttons for your choice. To apply a template, frame or button, you can just double click it. You can even add text, background music and background image to customize the menu. 5. Preview: please click when you have finished organizing the WMV video slideshow to check if everything is ok. If not, just go back to the previous steps. 6. Burn: click "Burn" tab to make the last settings and start burning WMV video slideshow to DVD. TV Standard: "NTSC" is 30 fps, which is used in USA, Canada and Japan; "PAL" is 25fps, used in Europe and Asia. After all these steps done, you will get the WMV video burned on DVD Disc and enjoy it on TV or DVD Player together with friends and family. You can learn more features about Wondershare WMV to DVD Burner. Have you heard of DAT video? We often see it in VCD, and in VCD the DAT video is MEG video. It is converted from MPEG-1 when burning. We may also come cross this video online. So in this guide I will show you how to burn DAT video to DVD disc for playback on TV DVD or players. Besides, you'll get to know how to make a DAT video slideshow with customizable menu and transitions. All you need is a powerful DVD creator like Wondershare Video to DVD Burner which supports converting DAT to DVD. You can download Wondershare Video to DVD Burner free from this official website. You can follow the following steps to get it done. Click "Load Video" to browse your computer and find the DAT movies, then add DAT movies from your hard drive to the program. Well they will appear in the collections pane. If you don't want to add any special effect and just want to convert one DAT file to DVD, of course you can do that directly. Just select the DAT video file in the collections pane, click "Burn" tab, a window will pop up for you to set the output target(you can convert DAT to DVD disc, DVD folder, or ISO), aspect ratio, etc. But if you want to convert multiple DAT movies or videos together to one DVD disc, making a slideshow would be a good choice for you! Drag and drop DAT movies from the collections pane to storyboard to start organizing a slideshow. Order: You can sort the order of the DAT movies in the storyboard by dragging and dropping. Add a slide: right click mouse and select the first option "Add Slideshow" to add a slide. Then you can add DAT movies to this slide. There are two other options: "Remove Slideshow" and "Play Slideshow", just do as you like. Edit a video: select a DAT movie in the storyboard, right click mouse, and you will see three options: "Edit", "Remove", and "Clear All". Just select "Edit" to edit video effects. Click "Transition" and you will see all the available transition effects in the transition pane. A simple click could help you to display the transition effect in the right window. Just drag and drop the transition effect you want to apply to the middle of two DAT files in the slideshow storyboard. Preview: click "Preview" to preview your slideshow. This step is to help you decide if everything is what you have expected. If not, you can go back to any of the previous steps to make changes to your project. Burn: this step is the same as the second step. Please go back to Step 2. TV Standard: "NTSC" is 30 fps, which is used in USA, Canada and Japan; "PAL" is 25fps, which is used in Europe and Asia. Now you have burned the DTA video to DVD Disc. You can enjoy the video on TV or DVD Player together with your friends and family. Some people may wonder how to convert MKV to DVD so as to enjoy HD MKV movies on DVD players. They even tend to use a video converter to converter MKV to AVI, then burn AVI to DVD disc. Actually, the conversion is completely needless if you have a powerful DVD Creator which supports converting MKV to DVD. Wondershare Video to DVD Burner is such an app to convert MKV to DVD for you to watch HD MKV movies on DVD players. What's more, you can easily edit MKV movies, combine several MKV files together to a MKV video slideshow with customizable menu and transitions. To free download Video to DVD Burner, please click the button below. Operation is quite easy, try for free! Click "Load Video" to browse your computer and find the MKV movies, then add MKV movies from your hard drive to the program. Then they will appear in the collections pane. If you don't want to add any special effect, of course you can convert MKV to DVD directly. Just select the MKV movie in the collections pane, click "Burn" tab, a window will pop up for you to set the output target(you can convert MKV to DVD disc, DVD folder, or ISO), aspect ratio, etc. But if you want to convert multiple MKV movies or videos together to one DVD disc, making a slideshow would be a good choice for you! Drag and drop MKV movies from the collections pane to storyboard to start organizing a slideshow. Order: You can sort the order of the MKV movies in the storyboard by dragging and dropping. Add a slide: right click mouse and select the first option "Add Slideshow" to add a slide. Then you can add MKV movies to this slide. There are two other options: "Remove Slideshow" and "Play Slideshow", just do as you like. Edit a video: select a MKV movie in the storyboard, right click mouse, and you will see three options: "Edit", "Remove", and "Clear All". Just select "Edit" to edit video effects. Click "Transition" and you will see all the available transition effects in the transition pane. A simple click could help you to display the transition effect in the right window. Just drag and drop the transition effect you want to apply to the middle of two MKV movies in the slideshow storyboard. Burn: this step is the same as the second step. Go back to Step 2. How to burn QuickTime Movie to DVD? While QuickTime movies could not be played directly on DVD player, it is a good idea to convert QuickTime movies to DVD and burn them to a DVD disc. You will need a DVD burner program to have the job done. Below is a step-by-step guide. Try, and you will get it! Follow the installation wizard. What you download is a free trial version and you may uninstall it anytime you want. During the installation process, you can insert DVD +R (DVD-R, DVD+RW or DVD-RW) into DVD-ROM. Click "Load Video" or select "Load Video" under the "File" drop-down menu to load QuickTime movies from your hard drive. Multiple video files could be added at a time. After the video files have been added, they will appear in the main interface. Display the loaded QuickTime movie by double click to choose the video files which you want to convert. If you have multiple video clips and want to burn them to a disc, organizing a video slideshow with customizable menu, transition effects and background music is a good choice for you. Just drag & drop loaded video files from the main interface to the storyboard below to start organizing a slideshow. Order: You can sort the order of the video files in the storyboard by dragging and dropping. Edit: Select a loaded video in the storyboard, click "edit selected video file", you may see a window with a box below for settings. There are five tabs here for you to crop the size, to trim the length, to adjust the video effect, to design your watermark and to plug-in subtitle. Transition: Click "Transition" and you will see all the available transition effects in the transition pane. A simple click could help you to display the transition effect in the right window. Just drag and drop the transition effect you want to apply to the middle of two video files in the slideshow storyboard. Click preview button to preview your slideshow to check is everything goes right. If not, you can go back to any of the previous steps to make changes to your project. At last, click "Start" to make the last settings like TV standard and Aspect ratio. Then start burning your QuickTime movies to DVD disc, or you may also burn it to ISO images files or DVD folder (with VOB files in it) saved on your hard drive. While protection of DVD discs seems to be commonsense in many people's eyes, they are likely to have overlooked the fact that overtime, DVDs can become scratched, damaged and even completely unusable. Buying new one is of course not a good idea, since it costs much and you may be no longer able to find the one that you have bought before. Therefore, it is very important for DVD owners to know correct ways of protecting their DVD collections. 1. Common sense: Do not use fingers to touch the shiny disc surface. Handle discs by the outer edge or the center hole. Keep dirt, foreign material, fingerprints, smudges, and liquids from the disc and wipe them with a clean cotton fabric in a straight line from the center of the disc toward the outer edge. 2. Store discs upright (book style) in original jewel cases that are specified for CDs and DVDs and not store discs horizontally for a long time (years). 3. Leave discs in their spindle or jewel case to minimize the effects of environmental changes. Store in a cool, dry, dark environment in which the air is clean -- relative humidity should be in the range 20% - 50% (RH) and temperature should be in the range 4°C - 20°C. Do not expose recordable discs to prolonged sunlight or other sources of UV light. 4. Use a non solvent-based felt-tip permanent marker to mark the label side of the disc. Do not write or mark in the data area of the disc (area where the laser reads). Protecting your DVDs is essential of course, while maximizing their value is of greater importance. Therefore, to make a step further, you can do more to backup and enhance them. 1. It only support MP4, MKV, or OGM format. If you want to rip DVD to other formats, HandBrake offers no solution. 2. I sometimes center on more video editing like length trimming. However, HandBrake frustrates me a lot. 3. Not all DVD's are supported by HandBrake. Those with protection methods other than CSS are not supported and must be handled externally with third-party software. 1. Select Copy Source from your DVD drive and DVD folder saved on your computer. 2. Select Output Target from DVD disc, DVD folder and ISO image. If you want to copy DVD to DVD disc, then you need to select disc from DVD-9 and DVD-5. DVD Copy from DVD-9 to DVD-5 is also available. 3. Select Copy Mode from full movie, main movie and custom mode. If you click custom mode, a window will popup for you to select titles on DVD to preview and copy. 4. Click "Start" to start copying your DVD.